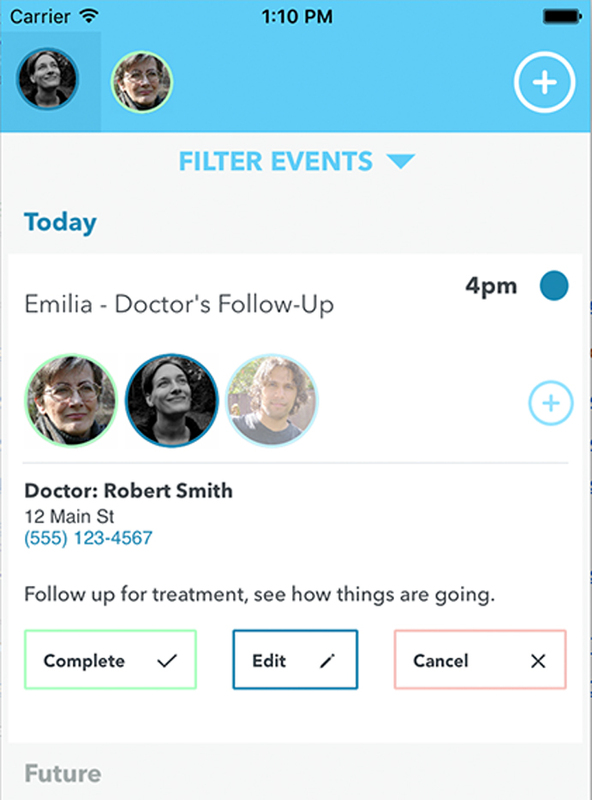 Coordinate all your caregiving tasks using one simple tool. 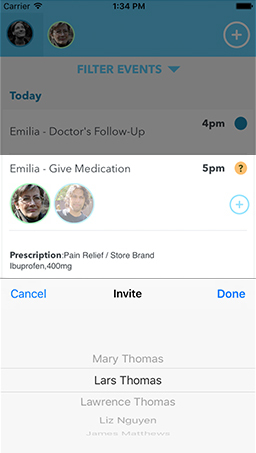 Invite others to help, assign tasks, store medication and other critical information, and make it easy and quick. My mother needed all of her six children and other family members to help take care of her during her two year battle with cancer. My family and friends, neighbors, and her health care workers used email, texts, voice mail and paper logs to coordinate her caregiving. We often talked about having a way for all of us to know that the care she needed was being given at the right time. So we came up with the idea of the Kincare app – nothing too complex or time consuming, just an easy way for us to track what needed to be done, and make sure someone was taking care of it. 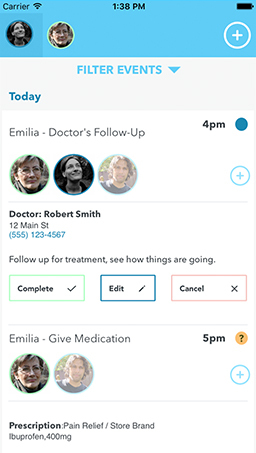 Kincare enables all those who are attending to the needs of a care recipient to see what needs to be done, and share the tasks easily and quickly among the group. Caregiving simplified. Kincare is built on a foundation of shared care giving where the care recipient, family members and professional caregivers can coordinate the care of a loved one. 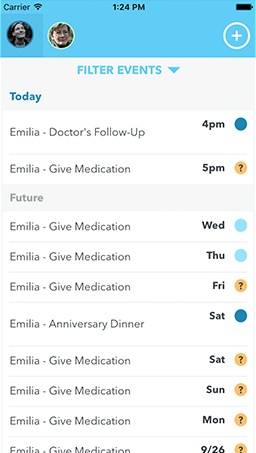 Whether you simply need to divide the scheduled activities, get help with a difficult task such as changing a bandage or flushing a TPN line, or merely check to see that your loved one has received their medications in a timely manner, Kincare makes sharing the work of caregiving easier and with complete accountability. Using Kincare’s intuitive design users can select the highlighted activity to easily access detailed information about each event. Based on the type of activity, each detailed entry will display the appropriate fields related to that event. For example, doctors’ appointments will include the address for the doctor while scheduled medicine will include prescription name, dosage and other details. Each detailed record will also show the current status for the scheduled activity. 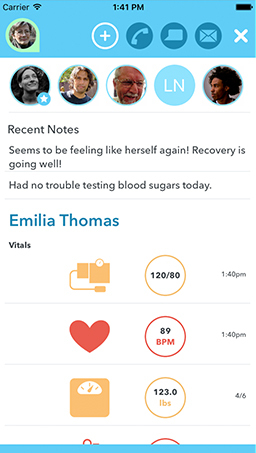 Using Kincare’s Vitals tracking caregivers can enter information on all vitals as well as some common ailments such as chills, constipation, diarrhea, fever, pain and even the care recipient’s mood. For some of these such as mood and pain, the caregiver can also select from a dropdown scale to provide even more detailed information. You can also report on this and other information during specific time segments such as last week, last month, last 3 months and other intervals. Reports can also be filtered in order to select one or more categories. 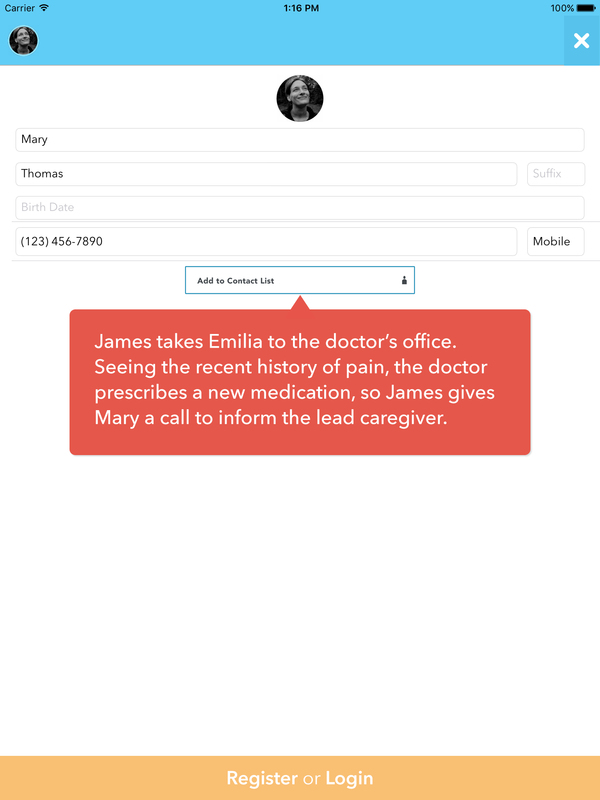 With Kincare’s built-in reporting caregiver’s no longer need to keep complicated detailed logs on medications, procedures, events, vitals or any other important bit of information. We do it for you. We maintain all of your historical data on every aspect of your health. All you need to do is run an report with a selected time period and with one or more categories of care. We tell you the time, date and all other relevant information for every event, medication, procedure, affliction and others. Here you can set the basic information for your Care Recipient and Lead Caregiver. 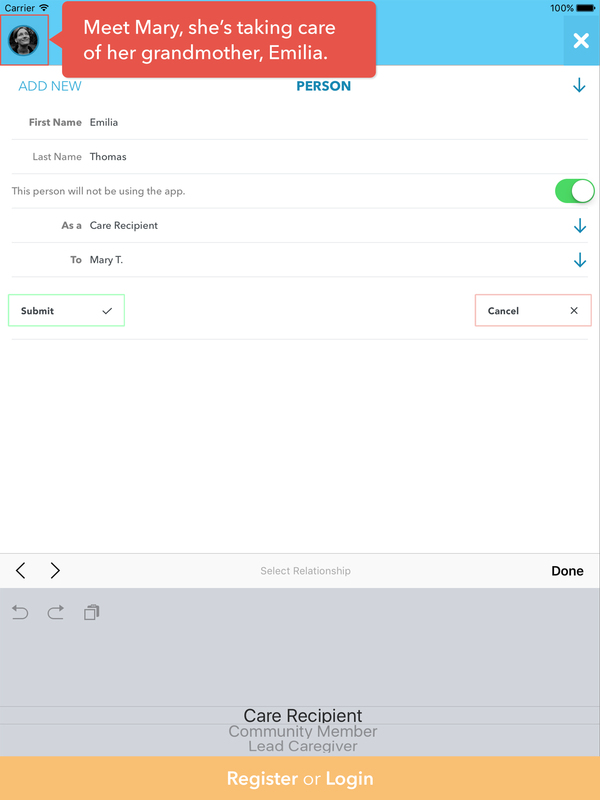 The app offers different features based on whether or not the Care Recipient will be using the app. Caregivers and Community Members can leave feedback about their recent visits with the Care Recipient. The Care Recipient’s vitals, mood, and other information is also displayed on this screen. These might include family, neighbors, friends, healthcare providers, and others. The Kincare app organizes their availability to help complete certain tasks. Community Members are able to communicate with the other members of the group to receive tasks, collect information and contribute to the caregiving process. 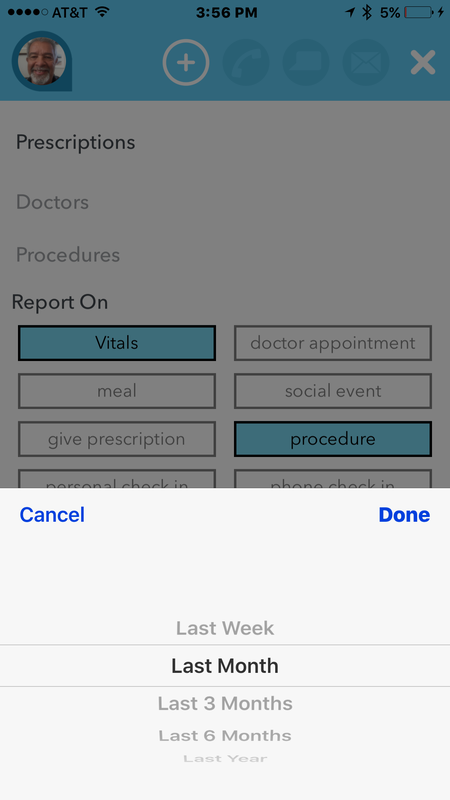 Tasks and visits can be scheduled easily from the app. If the Care Recipient has an appointment when you’re unavailable, you can ask other Caregivers to help. The Kincare app stores data securely to create a history for the Care Recipient. This data can be easily retrieved for use in doctor or pharmacy visits. 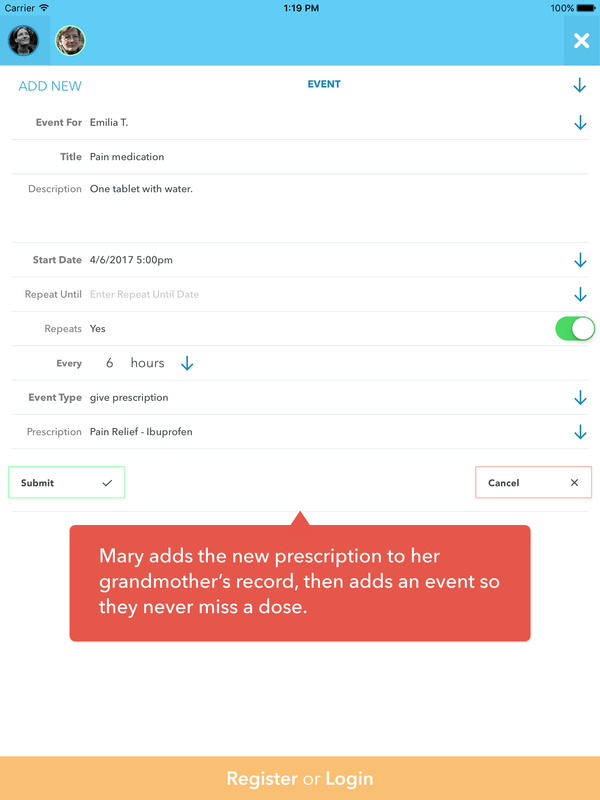 Caregivers can add new events to manage medication doses or other procedures that must occur at specific intervals. 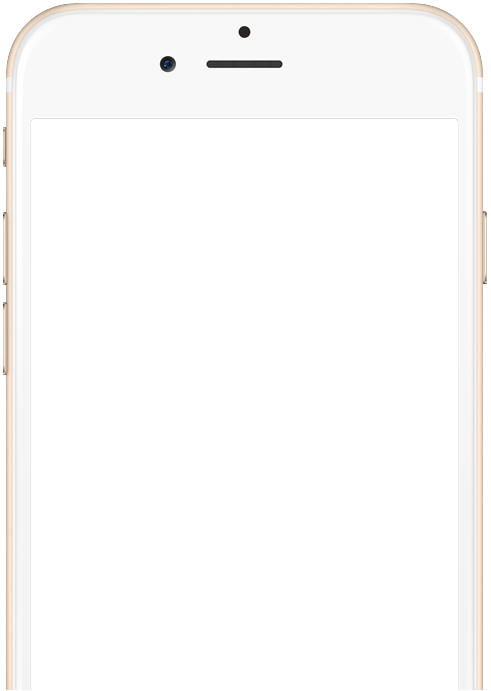 Users can set up automatic reminders for each event. Kincare is a free cloud based app designed to provide help in caring for yourself and your loved ones. Kincare provides various functions necessary for orchestrating home health care, including but not limited to scheduling, medication, communication, vitals tracking and coordinates care/ health coordination. How does Kincare keep patients information safe? 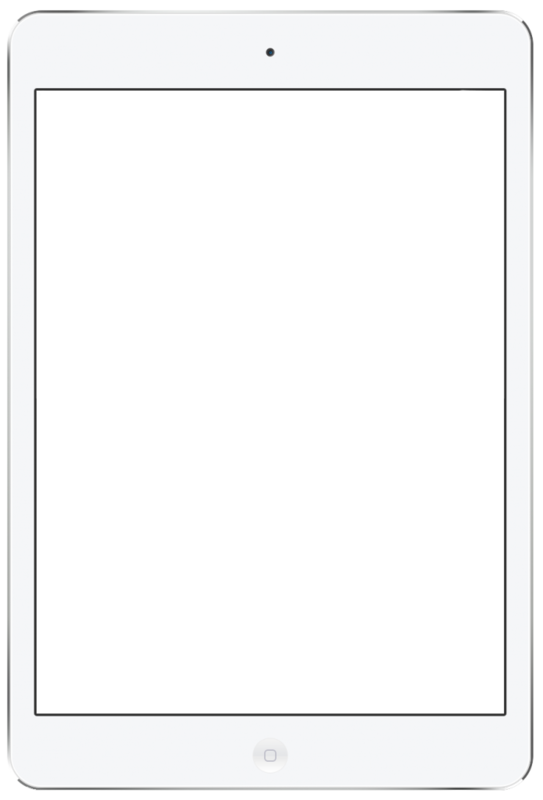 Kincare utilizes the fingerprint scan from the iphone to ensure users are verified before engaging with the application. Data protection is very important to the kincare team. All information you enter is encrypted while in transit as well as at rest. Our site is also HIPAA compliant. What does Kincare do to improve the care of loved ones? By nudging Kincare reminds caregivers of their responsibilities. Doctors appointments, procedures, medications are often complex and hard to keep track of. Kincare reminds you and helps you provide the best care possible. How much history does Kincare save? Kincare will keep all of health information and history and it can be accessed from your iOS device or Internet browser anytime you need it. When the internet is not available Kincare will keep one month of upcoming events giving you plenty of time to reconnect to the Internet. Once you reconnect Kincare will synchronize your mobile device data with your cloud data. Is Kincare’s data easily summarized and printed? Yes all of your health care data on Kincare can be accessed and printed on screen or to a printer. Our event viewer and report function can filter by person(s) and by type of event(s). Why and how does Kincare focus on coordination? Caring for a loved one can be difficult to coordinate between family members and hired caregivers. Kincare allows one or more family members to assume a lead caregiver role and invite others including family members, friends and caregiving professionals to participate. 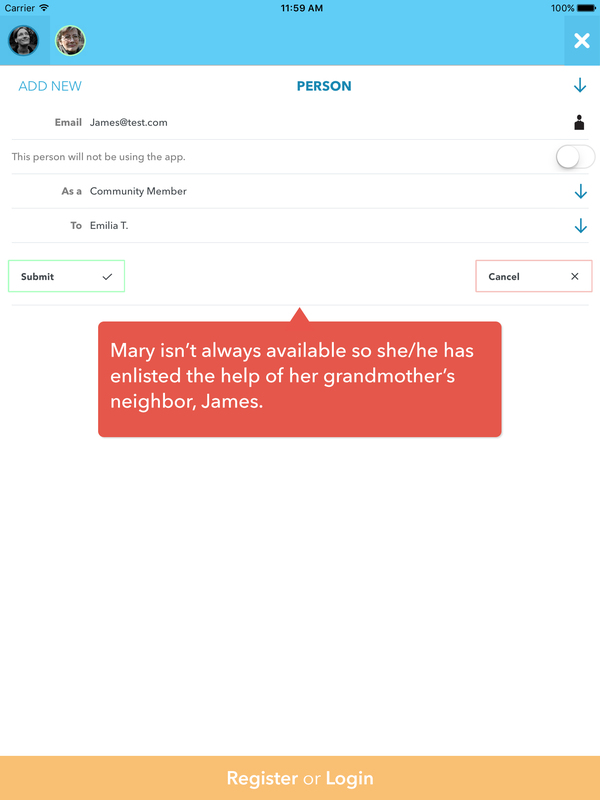 Events can be published allowing family members and others to “sign up” for specific tasks. They can also see that their loved one has taken their medicine, visited the doctor and even how their loved one is feeling.